Home Features Transfer Centre – Bacca deal close, Arsenal want Aina, Sampaoli interest. 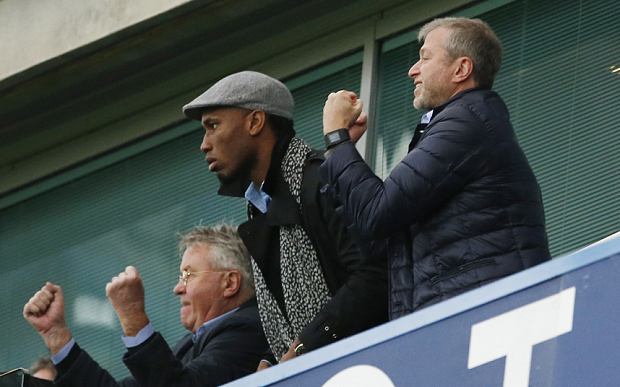 Football Soccer - Chelsea v Sunderland - Barclays Premier League - Stamford Bridge - 19/12/15 New Chelsea manager Guus Hiddink, Didier Drogba and owner Roman Abramovich celebrate after Pedro (not pictured) scores their second goal Action Images via Reuters / John Sibley Livepic EDITORIAL USE ONLY. No use with unauthorized audio, video, data, fixture lists, club/league logos or "live" services. Online in-match use limited to 45 images, no video emulation. No use in betting, games or single club/league/player publications. Please contact your account representative for further details. Transfer Centre – Bacca deal close, Arsenal want Aina, Sampaoli interest. Good evening Blues and welcome to Monday’s Transfer Centre from CFCnet, where we take a look at the latest transfer rumours surrounding the Stamford Bridge club. First up, it was frustrating to see that Arsenal are showing interest in the services of Chelsea’s right back Ola Aina. The youngster is part of Chelsea’s Under 21 side but his contract runs out this summer and so far he is yet to agree a new offer, being concerned about his first team chances. This comes as no surprise as many Chelsea youth players see no way in and are considering leaving, Charley Musonda being another one. Aina is a class act and already capped for England Under 21s. We must put a new system in place at this club to give youngsters a chance, an incentive to stay, otherwise we will keep seeing situations of buy backs and losing money on players such as Nemanja Matic who left for hardly anything and was bought back for a fortune. Meanwhile, Chelsea look set to be closing in on the signing of Carlos Baca from AC Milan. Chelsea have reportedly agreed to pay Milan’s asking price of £30 million for the 29-year old Colombian International. A deal is apparently close. Finally, Jorge Sampaoli has told Roman Abramovich that he will be interested in the vacant Chelsea Manager position, but only if the club sign Alexis Sanchez from Arsenal. Sampaoli who coached Chile to Copa America glory and would want the Chile star to go with him. The Argentine is currently negotiating a release from the Chilean National side and could be in the running at Chelsea.